Known throughout the world of sports as the home of the New York Yankees (MLB), Yankee Stadium served as the home of the New York Giants for more than a decade. In the early 1920s after being evicted from Polo Grounds, the owners of the Yankees began looking for a location to build a new stadium. After finding a suitable location in the Bronx, a new stadium was constructed and opened in April 1923 as the home of the New York Yankees. With a capacity of around 58,000, Yankee Stadium was the grandest stadium in the country. In 1925, the New York Giants were founded and began playing at the Polo Grounds. The team played football at Polo Grounds for more than 25 years before deciding to move into Yankee Stadium. On October 21, 1956 the Giants played their first game at Yankee Stadium against the Pittsburgh Steelers. By the time the Giants moved into Yankee Stadium in 1956 the stadium’s capacity had grew to 67,000 with additions to the main three tier grandstand. 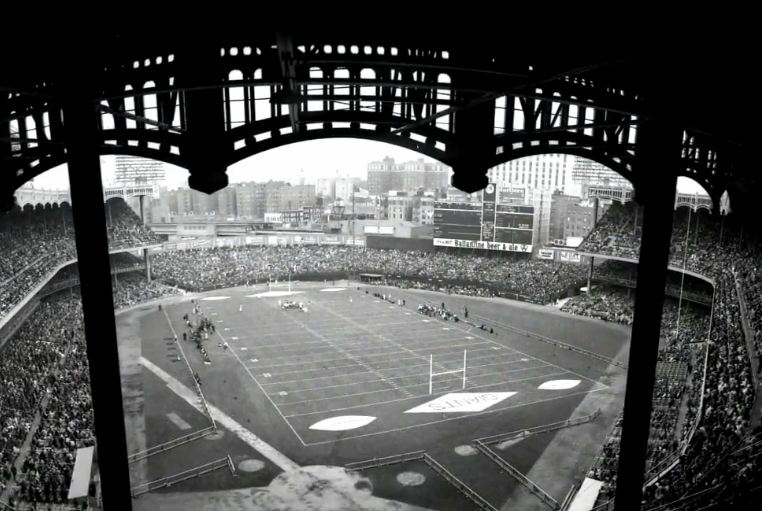 Prior to being the home of the Giants, Yankee Stadium had hosted football and numerous other events other than baseball. 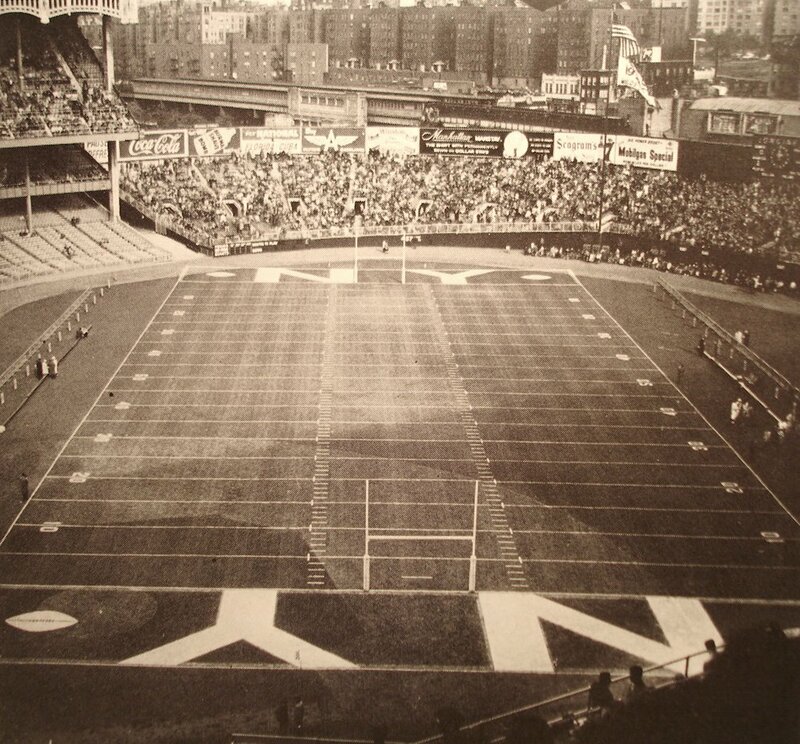 In order for football to be played at Yankee Stadium, bleachers were added in what would have been right field during a baseball game. The football gridiron was drawn out across the infield and into left field up the third base line. By the late 1960s Yankee Stadium began to show its age. The Giants had always wanted a stadium of their own. A local sportswriter proposed an idea for a new sports complex that would include a football stadium in New Jersey. By the early 1970s the Yankees decided to completely renovate Yankee Stadium that required them to play elsewhere for two seasons after 1973. The Giants played their last game at Yankee Stadium on September 23, 1973. Unfortunately the Giants new stadium was not ready for the start of the 1974 season. The Giants played one year at the Yale Bowl and one year at Shea Stadium before moving into Giants Stadium in 1976. The Giants had six playoff appearances and were the 1956 League Champions while at Yankee Stadium. In the late 1990s the Yankees began exploring the possibility of building a new stadium as Yankee Stadium lacked many of the modern amenities of newer ballparks built. In June 2005, the team announced plans to construct a new Yankee Stadium. Yankee Stadium was demolished over a two year period, completed by Summer 2010, and converted into a public park area featuring a baseball and softball field. Nearly 12,000 trees were planted in the shape of the stadium. For more than eight decades Yankee Stadium was the home to some of the greatest players in baseball. The Yankees played their last regular season game at Yankee Stadium on September 21, 2008. The new Yankee Stadium opened across East 161st Street in April 2009.